As regular visitors to the salon will know, I am a lady who loves to write. Whether fiction or fact, there is little I like better than settling at my bureau to set down tales of the long 18th century but today's guest makes me look positively lazy! Georg Christoph Lichtenberg was a gentleman of many and varied interests; scientist, writer and, would be novelist, though one plagued by procrastination, at his death he left behind a wealth of what have become known as scrapbooks, called Sudelbücher by Lichtenberg. As a student at Göttingen University, Lichtenberg began keeping notebooks. He identified each of the exhaustive volumes by a letter of the alphabet, beginning A in 1765. At the time of his death 34 years later, he was well-embarked on volume L.
These notebooks were not a record of studies and research though, nor a collection of memoirs; instead they were jumbled and scattershot lists of quotations or books, reflections on life in general and articles of varying lengths on a variety of subjects. 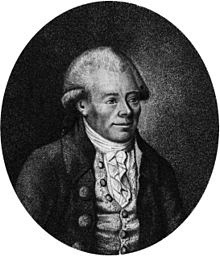 There is no narrative or overarching philosophy, no system or plan, they are the thoughts that occurred to Lichtenberg noted down without any plans for subsequent publication. The books did not remain private for long and a year after Lichtenberg passed away, his relatives published the Sudelbücher in their entirety over a period of years. A second print run followed after which all of G and H and most of K disappeared from the collection, apparently because they contained material that might be considered contentious or overly personal. The remaining books were given to Göttingen University, where they have remained ever since. How fascinating. Have all copies of G, H, and most of K been destroyed? They appear to have been "lost"; it's a lovely thought that they might turn up somewhere one day but sadly, I suspect it's unlikely. What a coincidence -- we have visitors from Ober-Ramstadt today. I will ask them about Lichtenberg.